Victory for voting reform in P.E.I. Charlottetown, P.E.I. – November 10, 2016 – In a major victory for electoral reform, voters in Prince Edward Island (P.E.I.) have chosen Mixed Member Proportional Representation (MMP) as their preferred voting system. After four rounds of voting in a plebiscite on electoral reform on Monday, MMP emerged as the preferred voting system with 52.4% of the popular vote. The second most popular option was the province’s current First-Past-The-Post (FPTP) system, which garnered 42.8% of the vote. The victory comes on the heels of an on-the-ground and online campaign by UFCW Canada’s Eastern Provinces Council (EPC), in which activists campaigned throughout the province supporting MMP as the most democratic choice for P.E.I. 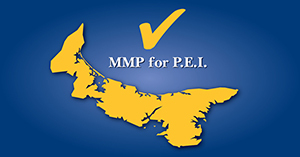 As part of the campaign, dubbed “Vote for MMP – The Best Choice for P.E.I.”, UFCW launched a website and Facebook campaign to raise awareness of electoral reform and MMP as the best voting system for P.E.I. While the plebiscite is non-binding, the result clearly indicates that voters in P.E.I. want to replace their current voting system with a proportional representation system that makes every vote count. “The plebiscite result is an important victory for voting reform, and it comes at a time when Canadians are also considering ways to make every vote count at the federal level,” says Paul Meinema, the National President of UFCW Canada. “The Trudeau government should take note of the fact that voters in P.E.I. and across the country want change, and use this moment as an opportunity to follow through on their campaign promise to reform our voting system for the next election,” Meinema adds.